Washington. 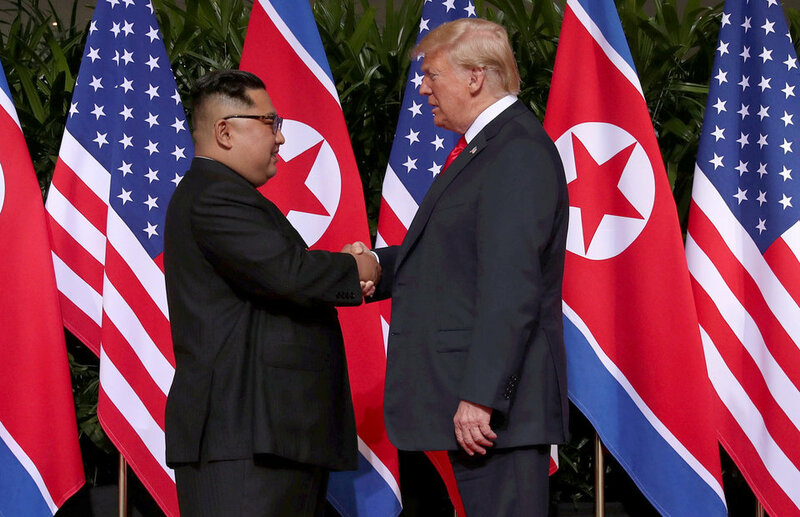 US President Donald Trump said on Wednesday he had received a letter from North Korean leader Kim Jong-un and expected to meet him again soon as part of the US administration's efforts to press Pyongyang to give up its nuclear weapons program. Speaking to reporters at the White House, Trump defended his negotiations with Kim and said he had never emphasized the speed of Pyongyang's denuclearization. Kim vowed to work toward denuclearization of the Korean Peninsula when he met with Trump for the first time at a summit in Singapore in June, but there has been little concrete progress since. Kim said in a nationally televised New Year address that he was ready to meet again with Trump anytime but warned he may take a "new path" if US sanctions and pressure against the country continued. A day earlier, South Korea's Chosun Ilbo newspaper reported that Kim had sent a message to Trump regarding the stalled nuclear talks. The report did not include details about the "letter-like" communication. Trump told reporters on Wednesday that the letter was great and that he would love to read it out loud, but did not do so. Trump has said previously that a second summit with Kim was likely in January or February, though he wrote on Twitter last month that he was "in no hurry." In his address on Tuesday, Kim said denuclearization was his "firm will" and North Korea had "declared at home and abroad that we would neither make and test nuclear weapons any longer nor use and proliferate them." However, he warned that North Korea might be "compelled to explore a new path" to defend its sovereignty if the United States "seeks to force something upon us unilaterally ... and remains unchanged in its sanctions and pressure." Kim's comments have fueled doubts over whether North Korea intends to give up a nuclear weapons program it has long considered essential to its security. Analysts said Kim's message sent clear signals that North Korea was willing to stay in talks with Washington and Seoul this year – but on its own terms. US Secretary of State Mike Pompeo made several trips to Pyongyang last year but the two sides have yet to reschedule an abruptly canceled November meeting between him and senior North Korean official Kim Yong Chol aimed at paving the way for a second summit. As well as demanding a lifting of sanctions, Pyongyang has been seeking an official end to the 1950-1953 Korean War in response to its initial, unilateral steps that have included dismantling its only known nuclear testing site and a key missile engine facility. US officials have said the extent of initial North Korean steps were not confirmed and could be easily reversed. Washington has halted some large-scale military exercises with South Korea to aid negotiations, but has called for strict global sanctions enforcement until North Korea's full, verifiable denuclearization.